Operation Crossroads was a series of nuclear weapons tests conducted by the United States at Bikini Atoll in the Marshall Islands in 1946. The purpose of the operation, which included two shots, ABLE and BAKER, was to investigate the effect of nuclear weapons on naval warships. They were the first tests to be publicly announced beforehand and observed by an invited audience, which included a large press corps. The tests were organized by a Joint Army/Navy Task Force and were headed by Vice Admiral William H.P. Blandy. A fleet of more than ninety vessels were assembled at varying distances around the Lagoon as a target. The target fleet consisted of older U.S. warships and submarines, three captured German and Japanese ships, and other surplus auxiliary and amphibious vessels. Some of the ships were loaded with live animals, such as pigs and rats, to study the effects of the nuclear blast and radioactive fallout on animals. A support fleet of more than 150 ships provided quarters, experimental stations, and workshops for the 42,000 men who participated in the test. Before the tests, all personnel were evacuated from Bikini Atoll and took safe positions at least ten nautical miles east of the atoll as a precaution. The residents of Bikini Atoll were resettled on Rongerik Atoll, approximately 125 miles away (read below for more information). The first test, codenamed ABLE, occurred on July 1, 1946 when an implosion-type atomic bomb (named Gilda) was dropped from a B-29 and detonated over the target fleet at an altitude of 520 feet with a yield of 23 kilotons. The ABLE test went smoothly, although the test weapon was dropped between 1,500 and 2,000 feet off the target ship in the middle of the lagoon. Five ships were sunk as a result of the test. The radioactivity created by the burst was short-lived, and within a day almost all of the surviving target ships had been safely reboarded for inspection. Even though the bomb missed its target by nearly half a mile, the nuclear radiation generated by the fireball had a significant effect on many of the pigs, goats, and mice placed on the surrounding ships. In the assessment of the Bulletin of the Atomic Scientists, "a large ship, about a mile away from the explosion, would escape sinking, but the crew would be killed by the deadly burst of radiations from the bomb, and only a ghost ship would remain, floating unattended in the vast waters of the ocean." The second test, codenamed BAKER, occurred at 8:35 AM local time on July 25 when an implosion-type bomb, suspended 90 feet underwater, exploded with a yield of 23 kilotons. The BAKER shot was the first underwater test of an atomic device, and the explosion produced so many unusual phenomena that a conference was held two months later to define new terms for use in descriptions and analysis. The underwater fireball generated by the blast took the form of a rapidly expanding hot gas bubble, which reached the sea floor and the sea surface simultaneously. The result created a shallow crater on the seafloor 30 feet deep and nearly 2,000 feet wide. At the top, water burst through the surface like a geyser, creating a massive "spray dome" containing nearly two million tons of water. The expanding dome stretched into a hollow chimney of spray called the "column," 6000 feet tall and 2000 feet wide with walls 300 feet thick. The space vacated by the rising gas bubble caused a tsunami which generated a wave 94 feet high. By the time the wave reached Bikini Island beach 3.5 miles away, a series of nine 15-foot waves tossed landing craft onto the beach and filled them with sand. Ten seconds after the detonation, falling water from the column created a 900-foot "base surge" which rolled over many of the target ships, painting them with radioactivity that could not be removed. The Arkansas was the closest ship to the blast and was lifted upwards by the rising water column. At 562 feet long (more than three times as long as the water is deep) and weighing 27,000 tonnes, the Arkansas was bow-pinned to the seafloor and toppled backward into the water curtain of the spray column. The spray generated by the blast coated the surrounding ships with radioactivity and the target fleet remained too radiologically contaminated for several weeks for more than brief on-board activities. All of the pigs and most of the rats used during the BAKER test were either killed by the initial blast or died shortly thereafter from radiological exposure. Operation Crossroads was terminated on August 10, 1946 due to radiation safety concerns. Army Colonel Dr. Stafford Warren, Chief of the Medical Section during the Manhattan Project, concluded that the effort to decontaminate the target vessels for a scheduled third test, CHARLIE, was futile and dangerous. The unprotected sailors tasked with decontaminating the ships' were stirring up radioactive material and contaminating their skin, clothing, and presumably, their lungs. As a result, Warren demanded an immediate halt to the entire cleanup operation. He was especially concerned about plutonium, which could not be detected by Geiger counters. More recently, in 2012 Lawrence Livermore National Laboratory reported that radiation levels were steadily dropping at Bikini. Terry Hamilton, scientific director of Livermore’s Marshall Islands study, attributed this progress to rehabilitation efforts in which potassium fertilizers are added to the islands’ soil while topsoil is simultaneously removed to further reduce radioactivity. Hamilton reported, “Conditions have really changed. They are improving at an accelerated rate. 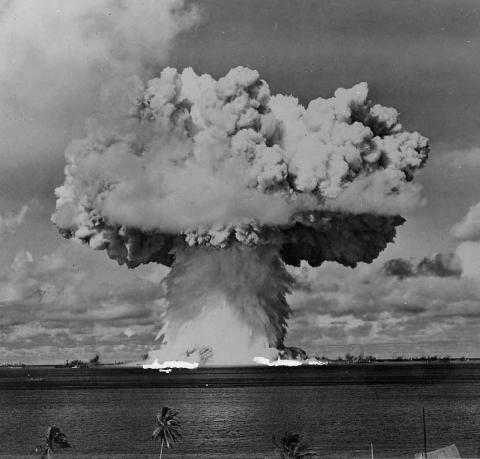 Now is the time when the Bikinians, if they desired, could go back.” For more on the plight of the Bikinians and the legacy of U.S. nuclear testing in the Marshall Islands, see this 2015 Washington Post report and AHF's article on the Marshall Islands. The Bikini tests also inspired the eponymous swimsuit. Paris Swimwear designer Louis Reard adopted "Bikini" for his new line of swimwear during Operation Crossroads. Réard's bikini was not the first two-piece swimsuit, but he explained that "like the bomb, the bikini is small and devastating." For more about the Bikini tests and their legacy, you can watch the documentary film "Radio Bikini" on YouTube here.